Disney's largest ever ship will have inside staterooms with "magic virtual portholes," one of the coolest new innovations on the high seas -- and already a hit based on advanced bookings. AOL Travel News was able to get a sneak peek at a mockup of the portholes on an exclusive visit to Walt Disney Imagineering (WDI) in California, the top-secret place where the Disney team creates features for Disney ships, as well as rides for Disney parks and other hush-hush projects. So what exactly is a "virtual porthole?" 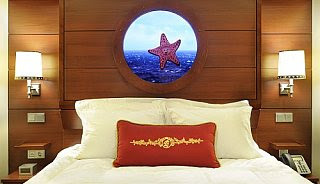 It's a big round "window" through which guests can see the real sea in real time, thanks to a live HD feed. Just like those in outside staterooms who have real windows or verandas, passengers in the inside staterooms will view waves, islands coming into sight and sunrises and sunsets. Only in this case they are seeing it on a 42-inch monitor. Bob Zalk, senior producer/director for WDI, explains that the live feed will be accomplished with four HD cameras mounted around the ship -- port, starboard, forward and aft. So wherever the inside stateroom is located -- and there are about 150 on the ship -- the virtual view will correspond. The idea is undeniably clever, making us wonder why no one has ever thought of it before. But that's not all. There's an added touch of Disney "magic" at play here. Animated Disney characters also enter the scene. So while you're gazing out at your ocean view, Peach, the starfish from "Finding Nemo," gets stuck to the window, the house from the movie "Up" floats across the screen and Tinker Bell whizzes past. The animation sequences are triggered when passengers come into the cabin, and play randomly, so you never quite know what you are going to see. Next to the mockup at the warehouse, there are boards displaying ideas for the animation sequences, and Zalk says the Imagineers are planning to have about three-dozen different animation snippets playing on the portholes. "With the Disney animated library being what it is, there is no shortage of Disney characters and scenes and vignettes we can choose from," Zalk says. "The challenge sometimes for us is not what will we pick, but how do we whittle those picks down to the best." The combination of virtual ocean views and animation instantly give cheap cabins a cool factor. "We think this is a really special treat for our guests," Zalk says. And don't worry -- if it all gets to be too much, or more likely, if the kids won't go to sleep in anticipation of the next surprise, passengers will have the option of turning the screen off.